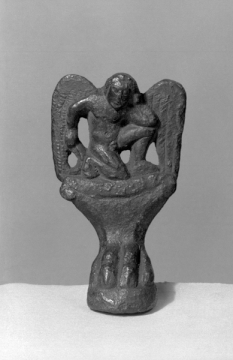 The foot of an Etruscan cista (a box for items of value) in the form of the figure of a winged genius above a claw base. You are here: CollectionsOnline / The foot of an Etruscan cista (a box for items of value) in the form of the figure of a winged genius above a claw base. On a round pedestal in the form of the claw of a beast of prey below a cushion capital, a youthful, winged figure kneels left, on right knee, and holds left arm on left knee, his hand at his head, with his right arm back and away from his side. Large wings fall behind his body so that the tips touch the cushion capital, creating extra support-backing for the piece. In his hands the figure holds uncertain objects - a nail (?) in the left, and a bent hammer (?) in the right. This is a fairly common form of cista foot decoration, but the two problems presented by objects such as these are: what is the nature of the "winged Genius" here represented and what are the atrributes he holds? Dr. Bieber publishes a similar foot1 and cites the well known ciste in Karlsruhe2 for comparison. She notes that the model of the kneeling winged demon is often employed for ornament and describes the attributes as hammer and nails, with rings on the feet. The Palestrina (Praeneste) Cista in the British Museum3, Etruscan fourth Century BC, depicting the Sacrifice of Trojan Captives at the Funeral Pyre of Patroclos, with a Maenad and Satyr on top, has feet with "Erotes" of identical type and better style than this example4. Unless the attribute is here so stylized as to assume a totally different shape, there appear to be at least two, and probably more, sets of objects held by these cista-foot figures - instruments of funerary (?) or at least religious significance to the Etruscans. 1 Cassel, p. 85, nos. 352, 353, pl. L.
2 Schumacher, Bronzen in Karlsruhe, no. 256, Taf. IV, 21 and XXV. 3 BMC, Bronzes, no. 638, p. XXXI. 4 For an account of Cistae, etc. in early Roman (Republican) art, see E. Strong, Art in Ancient Rome, I, pp. 66-68. 5 AJA, XLVII, 1943, pp. 217-226. 6 Giglioli, L'Arte Etrusca, Milan 1935, pl. CCXC, 1.